For the past few decades, the media and a few high-profile public figures (chiefly Al Gore, former Vice President of the United States and winner of a Nobel Prize for creating terror in the minds of millions) have been screaming at us that we are all doomed because the climate is changing! Not only is it changing, it is OUR Entire Fault! We puny humans have really done it now, in our quest for cheap energy and hot cars, we have spewed this horribly polluting but invisible gas into the atmosphere. That’s right, you are exhaling this “pollutant” as you read this. The gas to which I refer is none other than Carbon Dioxide (CO2)! Franco Maranzana: Some comments and ideas on the subject of Geoethics. Based on sound science practice , Geoethics has the objective to improve human behaviour on three main issues: two of them facing natural events such as climate changes (1), natural disasters (2), and the third concerning human activities. 1). By far the most important. We are not experiencing climatic changes for the first time. The Earth has witnessed many periodic cycles of dramatic change in temperatures as shown in figure 1. The colder periods are known in geological sciences as GLACIATIONS, a term also familiar to the layman, while the warmer periods are called by geologists INTERGLACIALS, certainly more of a professional jargon. The wording “Global Warming” (GW) came about as an usage frequently mentioned mainly in the last two decades. Although in principle we should use only the terms Glaciations and Interglacials, in effect we can extend the concept of global warming starting at very moment when at the end of the cold period the trend changes towards warmer temperatures, even those occurring much later. 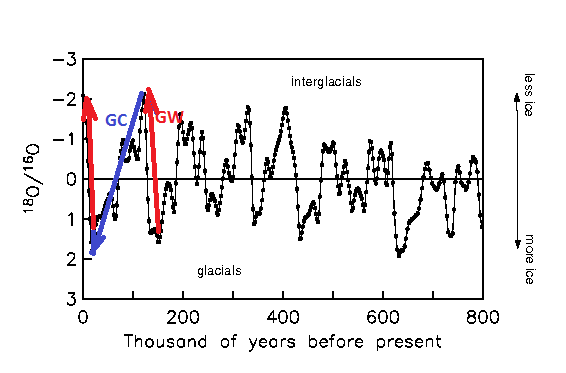 By the same token we should also introduce “Global Cooling” (GC), starting at the high of a particular Interglacial and directing towards cooler temperatures, as sketched in the figure. The extension of the concepts of global warming and the relative global cooling to all the five last glaciations, may indeed constitute a novelty.